What comes to your mind, when you hear Internet? Internet brings you accessibility, mobility, connectivity and most important, the feeling of world at your fingertips. So, when it comes to marketing, internet is the gateway. And internet is the world of social media, blogging, forums for like-minded people. When there are lots of e-commerce websites functioning and successfully running, the future of internet marketing is very strong. Internet marketing is a very broad term. Wide usage of smart phones has made common people aware of the internet. Without internet, even smart phone is useless. E-commerce websites rely heavily on the internet. Hence it is imperative that internet is accessed by lot of people, so that these websites can build their customer base. Survey shows that people prefer buying online because of many reasons like 1) choice at their fingertips 2) lazy to leave house 3) lot of choices in some gadget 4) discounts and free shipping. That’s the power of internet marketing! 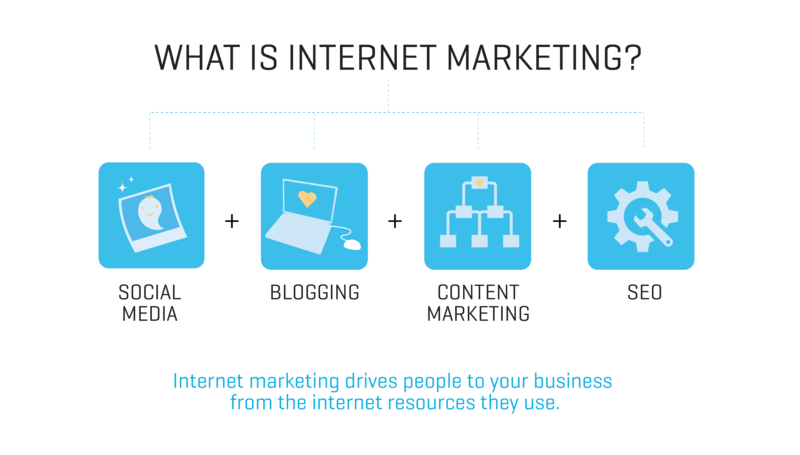 The question asked often is why do we need internet marketing? Businesses have been going on for centuries, even before the invention of internet and social media. True. But fact remains that today it is the `Survival Of The Fittest’ mantra in the world of Internet. Everybody wants to outdo everyone. It takes the skill of an experienced marketing tactics to stay in the game. Internet has reached near and far corners of the village. And so is social media. Marketing can be easily managed through different channels like blogs, Facebook, WhatsApp, Instagram and twitter. Since it saves time and cost, people are bound to use the services of e-commerce websites. Use internet marketing to build your customer base, interact with them and so that you can serve in a better way. Many people prefer internet marketing for convenience sake. For example, an office going person does not find time for shopping and on weekends, he prefers to rest, instead of shopping. Internet marketing is bliss for people like them, which allows them to shop at their preferred time. It is observed that the prices on the online websites are far more transparent as compared to the shops. And the customers have the privilege of comparing prices with other websites as well. This makes internet marketing, the favorite of shoppers everywhere. One cannot undermine the importance of internet marketing. Internet marketing is on rampage. Get hold of all your resources to stay abreast in this cut throat competition. Use Internet Marketing to your advantage by increasing traffic on your website. There are many portals from food, retailing to online grocery, everyone is surviving on customer reviews, social media and word of mouth appreciation. Internet Marketing is all about creating your own identity among many. Sometimes it becomes necessary to build your relations online with your potential customers rather than building business online. Use your online skills, engage in social media and hire the right influencers to create the right buzz for your portal. Keep your website updated with latest technologies, interact with customers and give excellent after sales service. Customers value all these personal touches, when shopping. So, roll up your sleeves and get in the groove. Create a campaign to attract new as well as existing buyers. Understand your audience and create a product that suits them. Online Marketing works 2 ways – establishing a relationship with your customers and customers in turn spread a good word for you. Media has a very good hold on youngsters, who are always willing to adapt to new changes and they are ones who use these social media frequently.